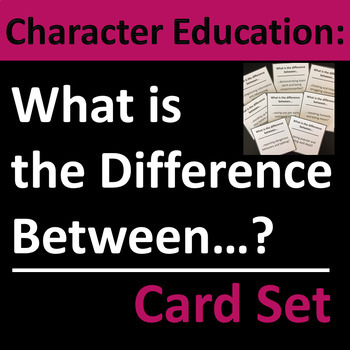 Character education cards require students to consider real-life scenarios, possible actions, and intentions. Thought-provoking homeroom, warm-up, character education, advisory, or life skills group discussion activity. 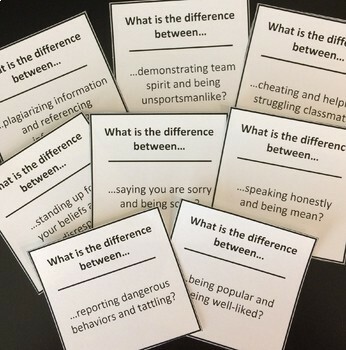 Cards can be used as a small group or whole group discussion activity, or as individual writing prompts. Set includes 40 cards plus blank templates for student- or teacher-generated questions (total of 8 pages). 1. …saying you are sorry and being sorry? 2. …reporting dangerous behaviors and tattling? 3. …cheating and helping a struggling classmate? 4. …lying and not telling the whole truth? 5. …giving a reason and making an excuse? 6. …following the rules and doing the right thing? 7. …demonstrating team spirit and being unsportsmanlike? Single user license - resource is intended to be printed and used by one teacher only. Materials may NOT be redistributed or posted on the Internet (including personal, school, or class websites). ©2017 Career and Employment Prep. All rights reserved. • Log-in to your account and go to the “My Purchases” page. Click on the “Provide Feedback” button. Provide a rating and short comment for each product. You will earn feedback credit that you can use on future TPT purchases. Your feedback is greatly appreciated! • On the top of the main store page, click on the green star under the store name to become a follower.